John Cariani’s "Almost, Maine" consists of nine playlets that take place in wintertime in the fictional, unincorporated hamlet of Almost, Maine. The plays refer to the same group of townspeople and they are joined by a sense of romantic magical realism. There are a lot of tender moments in the show, to which the audience at Out of Box Theatre has a tendency to audibly sigh "aw." Director Julie Taliaferro has made sure that every "aw" moment hits its mark. She has assembled as fine a group of actors as could be hoped to present the material. The framing scene puts Pete (James Connor) and Ginette (Linda Place) on a park bench, with snowy surroundings. They haltingly express their love for one another, but Pete goes off on a roundabout geographical tangent that has Ginette leave him until the end of the show. The timing and delivery of the prologue and epilogue scenes are wonderful, although the blocking of the final wordless moments could have presented the actors’ faces to more of the audience. "Her Heart" brings together tourist Glory (Leigh-Ann Campbell) and homeowner East (Matthew Young) when she decides to camp in his yard to view the northern lights. She carries a paper bag that we are led to assume might hold the ashes of her recently deceased husband. Instead, it holds something physically impossible. The ridiculousness of the bag’s contents and of the romantic underpinnings of the scene play against the deep sincerity with which the actors play each moment to lead to a satisfying conclusion. It sets the tone of the piece that was only hinted at in the prologue. Both Ms. Campbell and Mr. Young give charming, engaging performances with masterfully timed repartee. "Sad and Glad" pairs newly-engaged Sandrine (Emily Tyrybon) with former beau Jimmy (John Stanier). He’s a bit of an ever-optimistic sad sack, and she is eager to get back to her party in the restaurant. We think there’s an unhappy ending in store when a waitress (Amy Lucas) appears and adds a hopeful twist. Once again, the performances are all spot-on. "This Hurts" involves the laundy room encounter between Marvalyn (Heather Yager), a temporary boarding house resident with her boyfriend, and Steve (Davin Grindstaff), a damaged individual who is impervious to pain. The encounter leaves them both feeling something they never expected to experience. The reality of the physical violence in the playlet made audience members wince in sympathy, giving a slightly uncomfortable feel to the playlet. "Getting It Back" ends the first act with Gayle (Candace Mabry) arriving at the home of boyfriend Lendall (Andrew Hibbs), returning a passel of red sacks that contain all the love he’s given her and expecting all her love back too. What he gives her is both far less and far more than she expected. Ms. Mabry plays her part beautifully, and Mr. Hibbs counters her performance nicely, although there does seem to be an age disparity between them that doesn’t quite fit the text. After a bit of the framing scene, act two begins with "They Fell." Chad (Jeffrey Bigger) and Randy (John Stanier) discuss their love lives, treating falling in love as a physical action. It’s ridiculous, but engaging. Director Julie Taliaferro has timed it for maximum effect, and the performances amuse mightily. "Where It Went" and "The Story of Hope" follow, each of which has an ending that is less than hopeful. Jerry Jobe and Julie Resh (Phil and Marci in "Where It Went") seemed to have minor line problems in the performance I saw, which threw the rhythm of the scene off. In "The Story of Hope," Jessie Kuipers and Allan Dodson seem mismatched as Hope and the resident of the home her former beau lived in. That’s sort of the point, but Mr. Dodson’s delayed delivery didn’t really work to further the scene, although it did play up the mismatch. The lack of hopefulness in these two scenes worked as a counterpart to the rest of the play, but made for a bit of a lull in the action. The final full playlet, "Seeing the Thing," also has a mismatched pair in unromantic, take-charge Rhonda (Leeanna Lambert) and the smitten Dave (R. Clay Johnson). Here, though, the intention and follow-through are thoroughly comic. Paired with the tenderness of the closing epilogue, it brings a final "aw" to the evening. 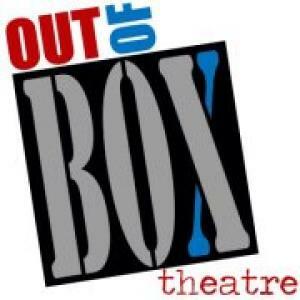 The stage at Out of Box Theatre is notoriously small. In "Almost, Maine," it’s used to perfection. There’s one angled wall with a door, a movable park bench and stools, and birch-wood-looking panels of varying widths arranged on the walls. The floor is painted with hatch work that suggest a snowy ground. The scenic design, by Christopher S. Dills, is enhanced by the lighting design of Jonathan Liles, which projects stars and a tree silhouette on the set and periodically adds a shimmering aurora borealis effect. Enhancing the overall effect even more is the scene-setting original guitar music by John Mistretta. Technically, this show is a knock-out, given the stage and lighting limitations of the Out of Box Theatre.